For 1-D linear barcodes, higher-density 2-D matrix codes, or direct part mark (DPM) codes, the DataMan 150/260 series fixed-mount, image-based ID readers deliver unprecedented performance, flexibility and ease of use. DataMan 150/260 series fixed-mount barcode readers achieve the highest possible read rates thanks to a high-speed, dual core processing engine that runs the latest Cognex algorithms. 1DMax™ with Hotbars II™ and 2DMax® with patent-pending PowerGrid™ technology decode damaged or poorly printed 1-D and 2-D codes, despite code quality, printing method or surface that the codes are marked on, and can even read 2-D codes without visible perimeters or quiet zones. DataMan 150/260 series models offer straight or right-angled configurations to fit into the tightest spaces. In-line and ninety degree configurations eliminate the need for equipment redesign, and complicated wiring or optical paths with mirrors. Codes on round, shiny, highly reflective, or specular surfaces very often require custom illumination to allow them to be read reliably. Low resolution codes and codes at long working distances also present reading challenges. 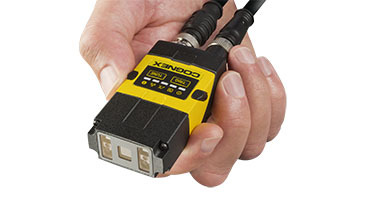 Cognex’s modular technology makes reading these codes simple. 16 mm lens - compared to the standard 6.2 mm lens, this lens can read smaller codes and codes at further working distances. Liquid lens technology - the liquid lens module gives you the ability to perform autofocus with no moving parts. High-powered Integrated Light (HPIL) - four high-powered red LEDs direct more light onto the code for better image formation. This feature is particularly useful for long distance code reading and high speed applications. Half-polarized front cover - 2 polarized LEDs and 2 unpolarized LEDs can be configured for custom lighting for any application. The polarized LEDs are ideal for shiny, specular surfaces, while the unpolarized LEDS are for long distance and high speed applications. Fully polarized and un-polarized front covers are also available, and can be easily interchanged. Advanced Control Solutions is a Cognex DataMan 150 distributor in Georgia, Tennessee, Alabama and Mississippi. We offer free evaluations and technical support to help our customers solve their applications.